Watch the video of 2 students, 1 with ADHD. You will notice differences. Some differences are directly related to ADHD. Others are the result of secondary characteristics. In special education these are characteristics of a student that result not from the disability but from how the disability plays out in an academic and other settings. For example, a student with a speech impediment may be very timid and anxious in situation in which he or she may need to speak. In math a major secondary characteristic is math anxiety. This is a performance issue vs an ability issue and it must be addressed as a legitimate obstacle for the student. I work with graduate students who still suffer math anxiety years later. As I shared in a previous post my approach is to focus on meeting needs. I want to elaborate on this. My secret is I listen to the student… In other words, the student drives the instruction. 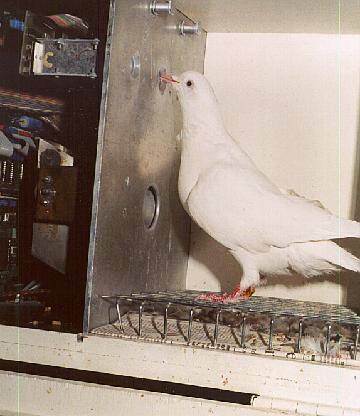 Here’s an analogy. You go to a frozen yogurt or ice cream store and they offer you a sample. You try a couple then go with the one you like. That’s what I do. I try out different types of instruction (samples of the ice cream) and the student tells me (verbally or by the response to the instruction) which one they want. That is the I in IDEA and in IEP. 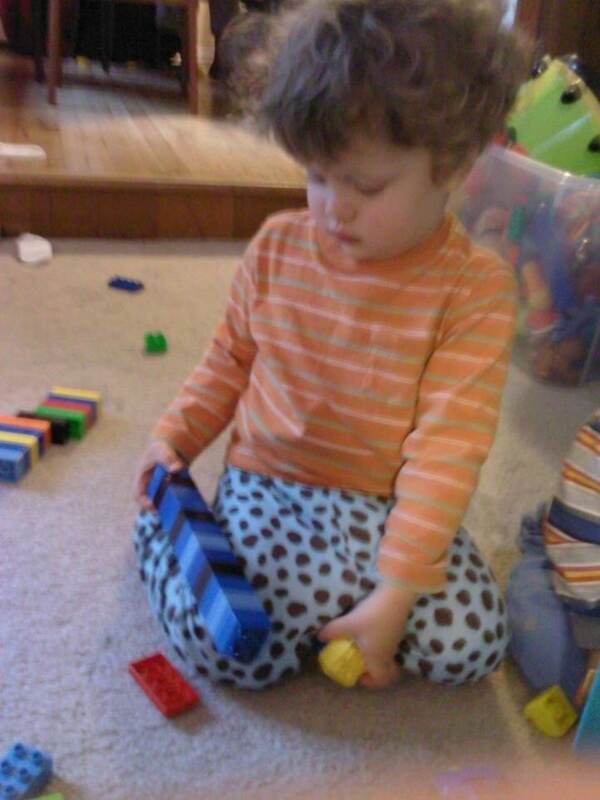 In the photo above you see a contrast between how children learn and how educators often teach necessary skills. Children learn to ride a bike by actually performing the target skills. 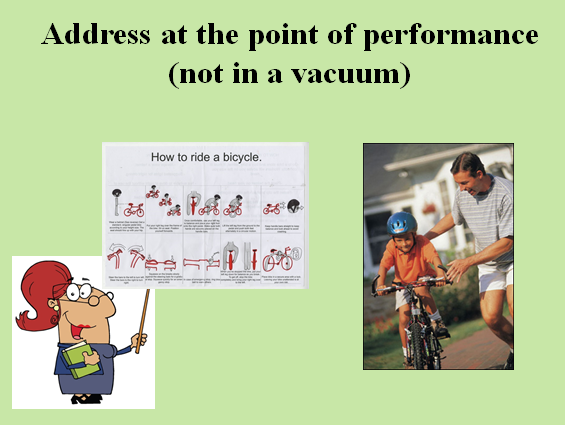 This is a performance point – the setting in which the child actually performs. In school students are often taught necessary skills in isolation, away from the performance points. Imagine teaching a child to ride a bike by having him sit at a desk while the parent points out all the steps for riding a bike. Often accommodations and supports are provided in isolation or out of context. Students with autism have lunch buddies in a contrived setting with an educator leading conversation. Students with ADHD have a weekly time to organize their notebooks. Students who have trouble functioning in a general ed classroom may be pulled out as a result. Below are a couple of examples of how support can be provided at the points of performance. 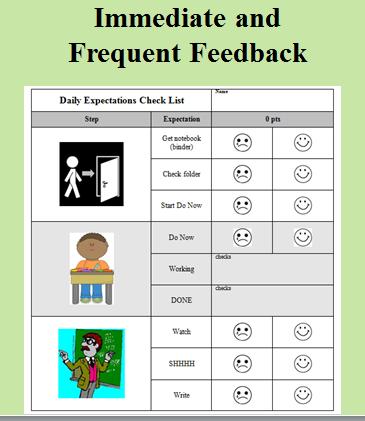 The photo below shows a checklist I used for a students with autism in my algebra class. They would follow the checklist and self-evaluate by checking off each step as it was completed. They were learning how to perform necessary skills at the point of performance. Another overlooked point of performance is in organizing a notebook. Students should organize a notebook while IN CLASS and on a DAILY basis. 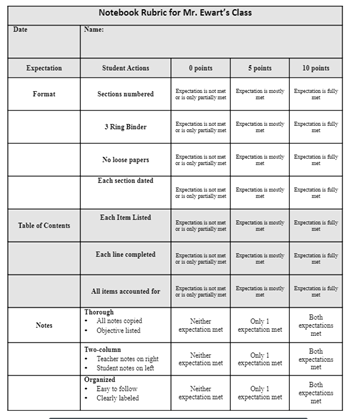 I use the rubric below to help support students with this task. Dr. Russell Barkley, an expert on ADHD, talks about performance points for students with ADHD in his book and in his ADHD Report. This focus at the “points of performance” can and should apply to any student with a disability (and students in general).